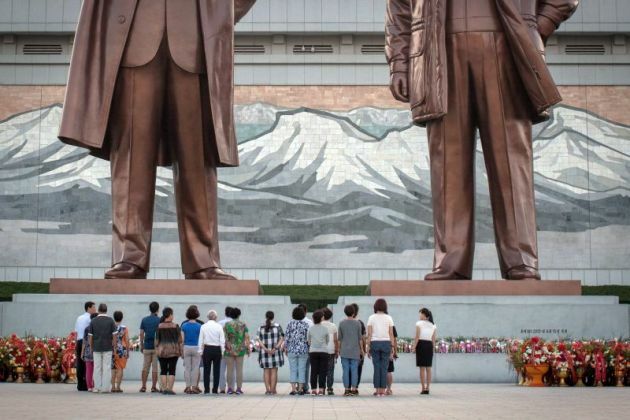 (Photo: © Sean Hawkey)Visitors at the monuments to North Korea's founding father Kim Il Sung and and his son Kim Jong Il in Pyongyang, North Korea. Following North Korea's latest nuclear weapon test, the World Council of Churches has redoubled its calls to reduce tensions on the Korean peninsula through negotiation rather than spiraling confrontation. The day after its sixth such test, Sept 4, South Korean officials reported that there are indications that the North is preparing more missile launches, possibly an intercontinental ballistic missile. South Korea carried out live-fire exercises in response to Sunday's test at a time that virtually all doves and hawks on North Korea seem to agree that sanctions against Pyongyang have not worked. "North Korea has done enough to demonstrate its capability as a nuclear-armed state," said Director of the WCC's Commission of the Churches on International Affairs Peter Prove. "The WCC strongly advocates for the complete elimination of nuclear weapons everywhere, including on the Korean peninsula where the risk of nuclear conflict is currently by far the greatest." Swiss President Doris Leuthard, also speaking Sept. 4, said Switzerland is ready to act a mediator and use the special role it has carved out in international diplomacy to host talks to help solve the current crisis over North Korea. This was contrary to the view of U.S. Ambassador to the United Nations Nikki Haley who said the same day that North Korean leader Kim Jong Un was "begging for war." She urged the U.N. Security Council to adopt the strongest sanctions measures possible to stop Pyongyang's nuclear program. Addressing a Security Council emergency meeting, Haley said North Korea's sixth nuclear test was a clear sign that "the time for half measures" from the UN had to end. "Enough is enough," Haley said. "We have taken an incremental approach, and despite the best of intentions, it has not worked." She did not elaborate on what next step the United States has in mind, but the Swiss president agreed that past measures had not worked, but she suggested something that President Donald Trump is not going along with. Leuthard, who spoke at a press conference in the Swiss capital hosted by the Foreign Press Association of Switzerland and Lichtenstein was asked if more sanctions are the answer to a missile crisis involving North Korea. "We live now for many years with sanctions. It did not change many things. The population suffers for all these sanctions, but they stay with their government, with their president. So, I think, it is really time for dialogue. "We are ready to offer our good services now as a mediator," she said noting that Switzerland has hosted peace talks on Syria and other conflicts. (Photo: © Peter Kenny)Swiss President Doris Leuthard addresses foreign journalists covering Switzerland in the Swiss capital Bern on Sept. 4, 2017. "It is really time now to sit at a table. The big powers have a reputation and a responsibility. Switzerland and Sweden can have a role behind the curtain" she observed saying they have done so before. North Korean leader Kim Jong-un had spent some time as a high school student in the Swiss capital Bern, but Leuthard could not say how this might influence any talks. "I think we all have an interest in a peaceful region there. It is not only a negotiation with the U.S. and North Korea. It is really an international issue," said Leuthard. "You have to find an international, political and reliable solution. That is in the interests of the whole planet. Nobody can risk having nuclear attacks, and therefore there must be a common understanding among those who have nuclear weapons and those who do not." It cannot be just be reduced to an American and a North Korean issue, said the Swiss president. 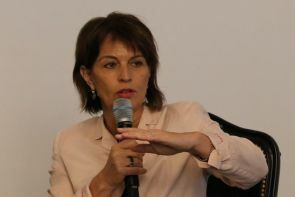 Leuthard noted that some newspapers had speculated that North Korea's Kim might be carrying on with his present antics to get the relevant powers to the negotiating table. In his statement the WCC's Prove said that the reality of North Korea's nuclear capability must be recognized and addressed through negotiation, not through escalating confrontation. Prove like Leuthard also expressed misgivings about the effects of further sanctions against North Korea, saying that they "would only be likely to harm the most vulnerable people in North Korea while adding to the political tensions." "The WCC calls on all parties to refrain from further escalation, to step back from this dangerous precipice, to take the path of dialogue and engagement, and to develop new initiatives for crisis management and tension reduction," Prove said. "The risk of conflict – whether by design or by mishap – and the magnitude of the consequences are too great to allow the present course to continue, and cannot serve the interests of any party in this situation." Now is the time for diplomacy, not for brinksmanship, he said. "We call on all WCC member churches to hold the people and churches of the Korean peninsula and of the northeast Asian region in their prayers, and to accompany and support them in their witness for peace and reconciliation."